I read this article and found it very interesting, thought it might be something for you. The article is called Southwest Curry Bowl and is located at http://www.gardendish.com/southwest-curry-bowl/. A bit of Thai and a bit of American Southwest come together to make Southwest Curry Bowl. Guests usually ask for seconds. You can make it more or less spicy by adjusting the amount curry paste. As we’ve mentioned in other curry-style recipes, we love the Maesri Thai Green Curry Paste and Maesri Thai Red Curry Paste . They’re oil-free, richly flavored, and were recommended by a Thai friend of ours. Thank goodness the world of frozen vegetables has expanded to include blends that mimic the flavors of various regions. They make the job of the busy family cook so much easier. 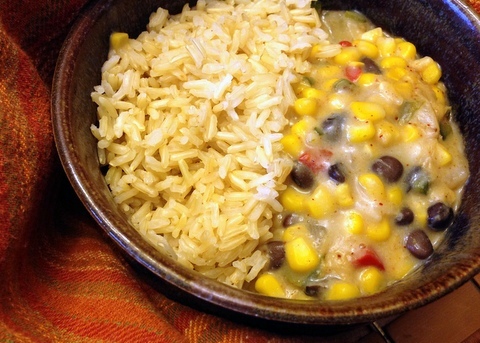 The southwest blend of corn, black beans, onions, and peppers that we use in this recipe is also sold as a “brazilian blend” in some of our local stores. Whatever it’s called, look for that combination, with the onions and peppers already chopped for your convenience. In a large non-stick skillet over medium-high heat, saute the frozen veggies until tender, about 5 minutes. Stir in the curry paste. Dissolve the cornstarch in the soy milk and add to the skillet mixture. Add the mushroom soy sauce, chili powder, lime juice, and brown sugar. Continue to cook until the mixture is hot and thick, about 5 minutes. Meanwhile, warm the rice in the microwave. To serve, ladle the curry over the rice. 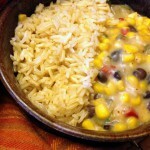 Have a nice cold drink handy - this dish can be spicy depending on your tolerence. Nutrition (per serving): 534 calories, 80% calories from carbohydrates, 14% calories from protein, 7% calories from fat, 10.9g fiber.